A LONER who tried to buy a gun, ammunition and silencer on the dark web was starting a five-year jail term today after an international operation thwarted his plot. When armed police raided the 48-year-old’s Dean Village flat in September last year, he casually pointed to the living room where the fake weapon and bullets were found stashed underneath a sofa. A judge told Mitchell yesterday: “These offences arose from your planned and deliberate conduct in attempting to acquire a working Glock pistol and a quantity of suitable ammunition. “It appears you formed a plan to obtain these items by carrying out research on the dark web,” added Lord Pentland. 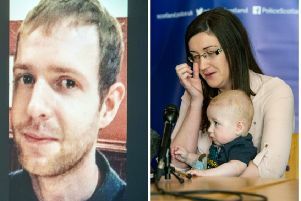 Mitchell forked out more than £2,000 for the firearm, similar to the sidearm carried by British Armed Forces, and 150 rounds of ammunition. The High Court in Edinburgh heard that a Homeland Security special agent intercepted the original parcel at Newark airport in the US on September 17 last year which was addressed to Pitreavie Court, in Dunfermline, Fife. It was found to contain an amplifier but hidden inside was a fully operational Glock handgun, a sound suppressor and bullets. Head of Police Scotland’s serious and organised crime unit, Detective Chief Superintendent Gerry McLean, told how his crack unit was scrambled after the tip-off from the US. “Information provided to us was that David Mitchell was thought to be responsible for the purchase of a firearm in the US and that firearm had been intercepted at a port of exit from the US,” said DCS McLean. The new Organised Crime Partnership, including police and the National Crime Agency and based at the Scottish Crime Campus in Gartcosh, were drafted in. Specialist investigators decided to carry out a “controlled delivery” of a package to Mitchell – essentially a harmless metal and wood mock-up of a gun and rounds. Sent off to Mitchell’s delivery address, his office in Dunfermline, surveillance officers staked out the unit on a business estate and lay in wait. It arrived on September 19 and Mitchell was seen signing for the package before taking it inside. At 6pm, he left his office with the package, apparently opened at one end, under one arm and put it into the boot of his green Skoda before heading for home. He was tailed back from Fife to his quiet residential street in Dean Village while armed cops were scrambled. They swooped on Mitchell’s flat, where he lived alone, with weapons drawn and found the packaging opened on a kitchen unit. Asked where the contents were, a “calm” Mitchell pointed to a sofa in his living room where the mock-up gun was found. Mitchell was arrested and taken to St Leonard’s police station for questioning. When quizzed on why he tried to buy the Glock, he replied “no comment”. Police have now been left baffled as to why this successful, well-educated software engineer, described by lead investigating officer DI Tom Gillan as “mild-mannered and polite” tried to arm himself. Not only is there nothing in Mitchell’s past hinting at a motive, but he has no known associates or links to the criminal underworld. A search of his flat failed to shed any light either. Police found no literature pointing to a potentially unhealthy fascination with weapons or any­thing linking Mitchell to ideological or political extremism. Forensic analysis of Mitchell’s computer led cops to conclude he forked out more than £2,000 for the Glock using cryptocurrency in August. The judge said he noted that Mitchell said he had no intention to cause harm to anyone but they were serious offences. Advocate depute Liam Ewing said that Mitchell “appeared distant” and was staring into space. He said that he suffered from depression and took medication for the condition. Mr Ewing said officers were concerned about Mitchell’s mental health and arranged a medical examination. A psychiatrist confirmed that he was fit to be interviewed. The pistol, silencer and bullets found at Newark airport, in New Jersey, were sent to Scotland to be examined by ballistics experts. The gun was found to be in working order, but the silencer was not suitable for use with the Glock. Mitchell, a prisoner in Perth, admitted purchasing and attempting to possess the pistol, silencer and ammunition between September 17 and 19 this year and attempting to possess a prohibited firearm. Defence counsel John Scott QC said: “It is a very unusual case. In all respects he is someone your Lordship might never expect to see before a court.” He said he was assessed as posing little risk of reconviction. He said Mitchell had “behaviour of a fixated nature focusing on a process” but has no serious mental illness.